This Total Training Library Includes Adobe Certified Associate (ACA) approved courseware on Photoshop, Dreamweaver & Flash." 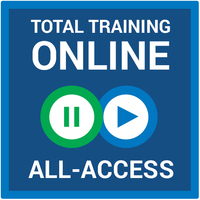 This comprehensive library gives you access to every online training title! With 229 titles to choose from, you're sure to find a lesson to help you master a new technique or learn a new program entirely. This is perfect for creative pros, designers, developers, office enthusiasts who need to master a new technique, or learn an entire program. What's included with a Total Training Online subscription? Having Issues Accessing Your Training? Below are a list of solutions for common Browser and Player issues that may be preventing you from accessing your online training. INTERNET EXPLORER 9 BROWSER If you are experiencing a black screen, content loading or buffering, we need to set the Compatibility View for the browser. To alleviate this issue, we need to set your browser to run in Compatibility View for our website. Quick Fix - Select Tools or Hit F12 on your keyboard. A new window will open at the bottom of your screen. In the first menu bar of that new window locate "Browser Mode" click on that and select IE9 Compatibility view. Once complete Hit F12 or the close button on the window to exit. GOOGLE CHROME BROWSER Below are suggestions directly from the Google Chrome help site to assist you in resolving the issue. The following link will take you directly to the Google Chrome help site area that addresses enabling add-ons or plug ins like the Windows Media Player Plug In Link. MOZILLA FIREFOX BROWSER The Firefox browser requires add-ons or plugs in to be enabled so that it recognizes components on your system. To verify this, when on your toolbar select Tools then Options. You should see a selection of programs/plug-ins that are already installed (i.e. Realplayer, Windows Media Player, etc.) Please be sure you have Windows Media Player enabled. If you need further information - here is an additional link to discuss the Windows Media Player plug-in for the Firefox browser.